People Ask Me If I Have Been Abducted . . .
Because I write alien science fiction, I am often asked if I had been abducted. This is possibly because much of what I write depicts the abduction process true to many people’s experiences. I have not attempted to discover if I am an abductee or not. However, I have had a number of episodes that could be an indication of being taken. My earliest recollection of odd events began when I was an infant. I have a very vivid memory of being in the sky above my home. Then, returned seamlessly into my parents’ bedroom where my crib was only a few feet away. I was frightened by the experience, but I was within the arms of a being who seemed to understand how fearful I was. She lifted the palm of her hand and a small orb lit the room enough to see my parents sleeping peacefully in their bed. An unspoken voice in my head said, “There, see your parents. You are now back home,” and I was placed back in the crib. I don’t recall seeing the face of the being who deposited me home, but I do recall it disappeared in an instant. This incident never left my thoughts as I grew older. I remember asking my mother about that night when I believe I was four years old. She simply passed it off as a dream. I believe many of us have dreams that actually could depict an abduction in our past. If they are like me, that dream is a haunting reminder that “something” happened, but aren’t interested in discovering the in fact they possibly were abducted. Why? Because even though today there is more of an acceptance of aliens, anyone who claims they were taken by them still is subject to being ridiculed, or not fully connected with reality or worse, by a large portion of our population. Face it – dreams, good or bad, are manageable explanations. Discovering proof of abduction by hypnotic regression is a frightening thing, even if the experience wasn’t entirely bad. It’s not always easy to face the truth. There is ample opportunity for me to discover if aliens are part of my life, but there is that mystery of the unknown that I believe has helped me create my books. The idea for the Gray Guardians Seriessprang from a dream that was so intense I couldn’t help but begin telling the tale, and it is still the basis of all my creativity. So to answer the question, “have you been abducted,” go to my website: https://www.grayguardians.comand listen to or read the first chapter of Earth’s Ultimate Conflict. The event depicted, although the names have been changes to protect the innocent, is an actual, terrifying event that happened when my daughter was three months old. From that point on in the book is speculative, future fiction, but who knows? AlienCon lands at the Pasadena California Convention Center June 15 – 18! This is the adventure of a lifetime. Gray Guardians Book Series author Kathy Porter will be in booth 208! Readers agree, you will never feel the same about the occasional ringing in your ears! Do You Hear Us Coming for You? It is well-known that thousands of people worldwide claim to have been abducted by aliens. One thing they share is experiencing a strange ringing or buzzing in their ears just prior to the abduction. Experiencing a premonition to an impending abduction could be one reason for the disturbing sounds. However, others feel it is a previously implanted alien tracking device that activates once the alien ship or ships are near. Theoretically, they implant the device into their desired victims at a very young age and continue abductions for many years. Entire families are often their prey, especially if they are productive reaping for DNA. Females are desirable for breeding their alien-human hybrid children. Now, some of you are wondering what reason aliens would have to steal us during the night or day and use humans to create this new hybrid race. There are many possible directions we could go with that. Perhaps they are experimenting with our genetics to create a new species that will eventually intermingle with humans. Presumably the Grays, who are most identified as the abductors, are attempting to create a bridge between our species and pave a way to peacefully coexist with us. They may be certain by now that humans will care for the hybrid children. Often, hybrid children are reunited with one or both human parents. During these visits, the parents often recall the Grays closely guarding the hybrids, observing how the parents welcome their offspring, even if they are not completely human. Another reason for abductions could be that the Grays are mutants trying to reverse-engineer a gene pool of human and Gray DNA to recreate their original, thriving species. In this scenario, we humans would be entirely experimental breeding subjects. We cannot overlook the fact that perhaps they are simply playing cosmic gods, creating a new species to place on a faraway planet and observe their ability to develop and grow a new civilization. Maybe even prod and poke them into their desired creation. So now we have theorized why they are abducting humans, and that takes us back to the ringing in the ears of potential abductees. Is the ringing in the ears an accidental side effect of the implant they use to track humans? Or do you think they intentionally give a heads up that “we’re here and coming for you” . . . maybe tonight? Still, we must consider that humans have premonitions and instincts that creep into our daily lives as an alert or warning to be prepared. Do you experience ringing in your ears? Have you ever suspected you’ve been abducted by aliens after a strange dream, a tossing and turning night, or a strange memory? The Grays are the subject of the Gray Guardians Book Series. Within this sci-fi saga, you will discover a perspective on aliens you may not have considered. What if a worldwide pandemic, increased seismic activity and climate change are all linked to aliens and alien abductions? What if our world is being manipulated by aliens? Earth’s Ultimate Conflict and Escape from Nuur are the first two books in the Gray Guardians Series, available in paperback, eBook, and audiobook formats. Readers agree – you will never feel the same about the occasional ringing in your ears again. When is the Last Time you Saw a UFO? In the past, I would ask if you have ever seen a UFO. With our government taking more of an interest in UFOs coupled with the continuous Vatican UFO investigations it doesn’t appear to be the correct question any longer. The fact is, more people now than ever in modern history see UFOs, and we have thousands of videos, photos and eyewitness accounts. So the more appropriate question is when rather than if you have seen a UFO. I know, I know there is no proof other than the collective eyewitness’s, videos and photos of UFO’s and alien sightings. What they call circumstantial evidence. In this case, circumstantial evidence is a series of facts stated by a multitude of witnesses often supported with video proof of UFOs. In a court of law, this amount of circumstantial evidence provided to a jury regarding let’s say a murder is taken very seriously when presented. It could potentially put someone in prison for a long time. So why is circumstantial evidence taken so seriously for murder and many other crimes, but aren’t considered the proof alien existence and their earthly visitations? I understand many of the videos are grainy but have you seen the out of focus conveniences store robbery security videos? Somehow from those blurry videos, they manage to get the perpetrators ID and there is no question they found the right guy, right? The videos are plastered all over the news as proof the robbery took place and they are able to obtain hundreds of tips on how to find the unknown subject within hours or minutes of it being aired. Nearly all the evidence on alien existence is, of course, circumstantial and therefore subjected to doubt and disbelief. However, even the physical proof of alien implants being extracted from alien abductees is explained away buy most. If a bullet was found in a holdup victim that was made from metal that wasn’t from this earth would it be believed? An implant is pretty much the same as a bullet. It is put in a human body by force and should be considered factual evidence just as a bullet would be. But no, not so with anything alien. In fact is seems all evidence of aliens is considered as more proof they don’t exist. It’s not clear enough, the witnesses are not believed, and the physical evidence is always questionable leading us to one solid undeniable fact. What is believable circumstantial evidence from a crime scene will never be accepted as proof of alien existence, period. In the Gray Guardians Space Opera Book Series, I delve into the disbelief aliens exist and how potential ‘Men In Black’ types are dedicated to keeping all alien contact hidden with denial and disinformation. The fact that we are very intentionally kept in the dark and the reasons why will stun you. Gray Guardians is a fictional book series, but you will wonder where reality ends and fiction begins. Also discover a plausible reason for aliens to visit Earth and why they abduct humans. Earth’s Ultimate Conflict is now an audiobook. In past blogs, I have discussed the fact that the Catholic Church has a unique connection to space aliens. 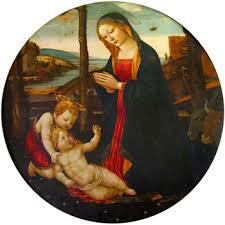 Aliens appear in many religious paintings, dating back to the birth of Christ. Speculation abounds on whether it was actually an alien spacecraft that was the guiding light of the Star of Bethlehem, and that The Three Wise Men may well have been aliens. The Church also claims that space aliens are our brothers and sisters. What do they know? If aliens are our brothers and sisters, and we suspect are the people that helped create our own Christian beliefs and traditions, they must celebrate the Birth of Christ as they taught us to do. Perhaps Aliens gather for great meals together to celebrate Christmas. Do they exchange gifts or are they more spiritual and past material needs? Do they have churches and celebrate the Birth of Christ with rituals and pageantry? Or do we already know their celebration? Was their coming to Earth and lighting the way for the Christ Child part of their celebration? Is that their way? Did they seek out and prepare new civilizations for the coming of Christ? If so, our space brothers and sisters guided a religion and honored us with their gifts. They began a story that would endure for centuries. Are they still watching us, and do they approve of how we have continued since they shone their guiding light upon us? Other ancient aliens species may have introduced our other major religions, each bringing their own beliefs to our young civilizations. Gray Guardians Book Series will be at the Alien Con! Visit us in the Grand Ball Room at table A104! Poster have arrived! Receive one free poster with each Gray Guardians book purchase at Alien Con! Kathy Porter will be available to sign books and Posters! Book three in the Gray Guardians Series will be arriving soon, but you can get a sneak peek at the cover at table A104 in the Grand Ball Room! The newly released Mother Earth Anthem, a song featured in book three, The Journey is now available for only $.99! Do you have your pass for Alien Con? There is still time! If you have followed my blog at all, you know I have written several that include UFOs and the Catholic Church. Easter has enormous links to UFOs. 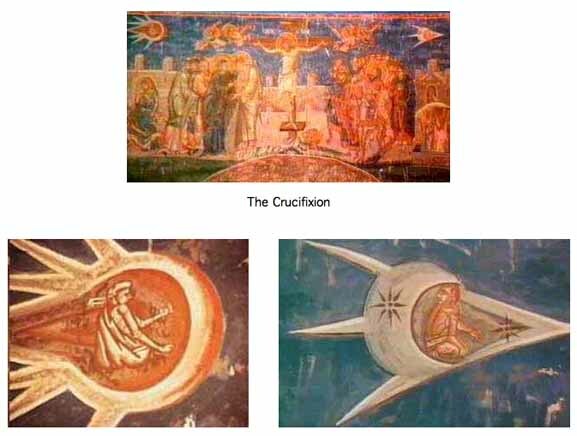 Several ancient frescos and paintings depict UFOs during the Ascension of Christ. The life of Jesus was chronicled in many ancient artworks. His birth, I believe, may have been the moment aliens made first contact. It may have started with a UFO creating the bright Star of David that led the Three Wise Men to the manger of His birth! 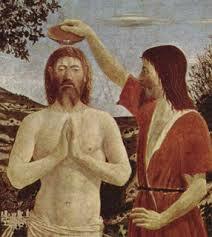 When John the Baptist baptized Jesus, an artist portrayed the event with a spacecraft sending beams of light down on John and Jesus. 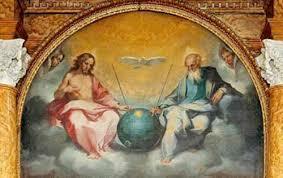 UFOs are in so many religious paintings it leaves little doubt aliens are here and have been around since Jesus walked the earth. The Catholic Church has long been considered to have an alliance with aliens. The fact that the church was the first religion to go public stating aliens “are our space brothers and sisters,” makes a very firm case for such an alliance. Aliens have been here for thousands of years. So what is the purpose of UFOs arriving at the time of Jesus? Were aliens here to welcome Him? Were aliens here to acclaim Him and make His arrival known to a larger audience by their presence? Or did they bring him? Were aliens sent by God to bring Christianity to our planet? Did aliens come to earth to teach us about Jesus and introduce mankind to Christianity? I would love to hear your UFO thoughts!